More performance, thanks to a Hybrid Synergy Drive that is 90 per cent newly-developed, with significant improvements over the system used in previous Toyota hybrid models. The 2010 Prius improves power by 22% while simultaneously improving fuel consumption by 7% compared to the current generation. Less money at the gas station, thanks to improved fuel consumption of an estimated 3.8L/100km combined – even better than the segment-leading efficiency of the current generation Prius. More innovation, in the form of more than 1,000 patents covering everything from essential performance and safety systems to available comfort and convenience features. Less resistance, thanks to an aerodynamic body design that delivers Toyota's best coefficient of drag (Cd), thereby improving fuel efficiency and reducing road noise. More versatility, thanks to the ample and flexible liftback design and improvements to boost winter performance. Less worry, from a decade’s worth of experience in building and maintaining top-quality hybrid vehicles. More comfort, from additional rear-seat legroom to Toyota’s first solar-powered ventilation system that pre-cools the Prius cabin in summer. Less footprint, thanks to the new Prius’ ability to operate in electric-only mode, improved fuel efficiency, reduced emissions, and the use of environmentally-responsible manufacturing methods and materials, such as LED headlights and plant-derived, carbon neutral plastics. More safety, with a full suite of vehicle control systems, active headrests and seven airbags as standard equipment. “For Toyota, designing the Prius has always represented an exploration of the car of the future. And now, more than ever before, that future car is here – not five years from now – but on its way to Toyota Canada Dealers and Canadian driveways this spring,” noted Stephen Beatty, Managing Director of Toyota Canada Inc.
Pricing for the 2010 Toyota Prius will be announced shortly before it goes on sale in late spring. Consumers can visit www.prius.ca for information and updates on the 2010 Toyota Prius, including photo and video content. Celebrated as tomorrow’s car for today, the Prius has delivered superior fuel economy and ultra-low emissions to more than one million owners worldwide for more than 10 years – including more than 14,000 owners in Canada. That decade of proven success is testament to the reliable, durable performance of this hybrid leader. Going on sale in Canada this spring, Prius succeeds in delivering innovative, future technology in a way that can be embraced by all drivers. Steering wheel touch controls that provide feedback via the instrument panel display. The first-generation Prius entered the market in 1997 as the world’s first mass-produced hybrid. The name Prius, “to go before” in Latin, became symbolic of a car that was launched even before environmental awareness had become a mainstream social issue. From the beginning, Toyota’s full-hybrid system was developed in-house and has become a driving force behind advanced vehicle technology. The company’s exclusive Hybrid Synergy Drive System was introduced in 2004 on the second-generation Prius. Since then, more than 14,000 have been sold in Canada. In designing the new, third-generation Prius, Toyota engineers combined a careful refinement of existing systems with innovative new technology necessary for the future of automobiles. The new Prius will be built using processes that reduce pollution in every stage of vehicle life, from production and driving, through to disposal. 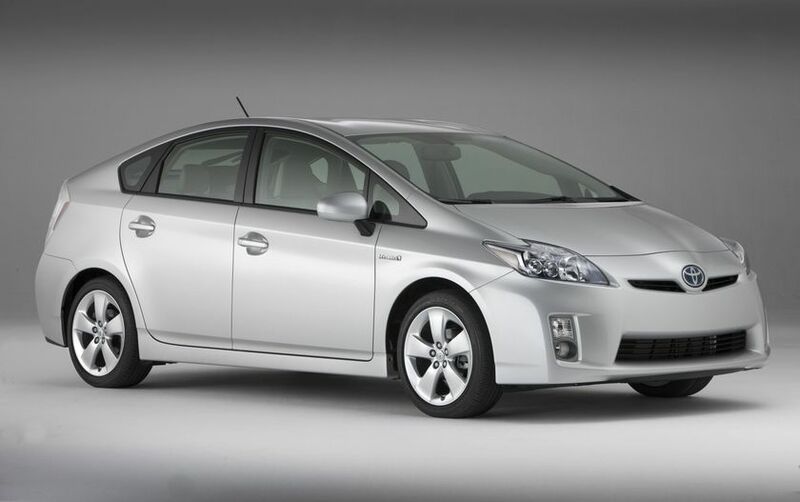 The first-generation Prius was rated 4.6 L/100km combined fuel consumption. This improved in the second generation (current) Prius, which is rated at 4.1 L/100km, combined city/highway. A combination of technologies and materials, coupled with new design and engineering, have reduced fuel consumption in the 2010 Prius to an estimated 3.7L/100km in the city and 4.0L/100km highway, for a combined rating of just 3.8L/100km. 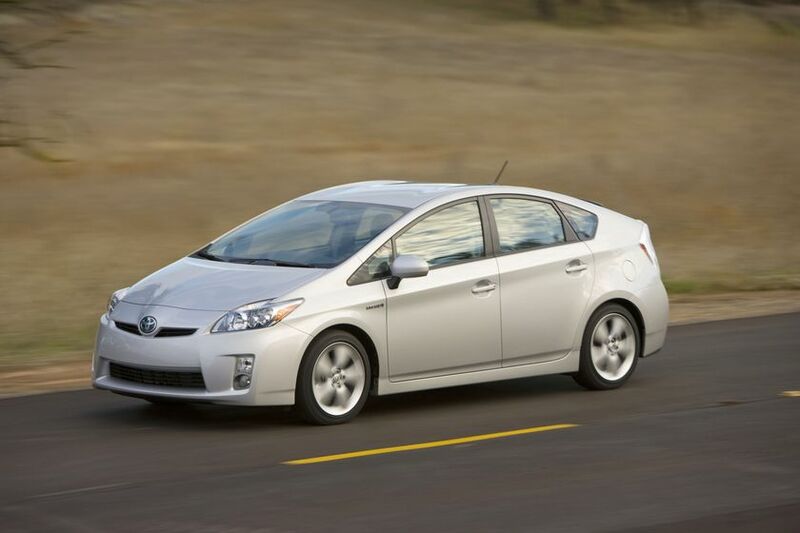 Unlike most other hybrid vehicles available, Prius has been a “full” hybrid since introduction. This allows it to run on engine alone, battery alone, or a combination of both. The system blends the best of parallel hybrid and series hybrid designs to achieve the ability to operate on the electric mode alone, and to charge the batteries while the car is running. Eco Mode helps the driver achieve better fuel economy. The patented Hybrid Synergy Drive system in the 2010 Prius is 90 per cent newly-developed with significant improvements over previous models. The transaxle is lighter in weight and reduces torque losses by as much as 20 per cent compared to the previous model. The inverter, which converts direct current to alternating current, has a new direct cooling system to reduce size and weight. Taken together, the inverter, motor and transaxle are smaller, and 20 per cent lighter. A newly developed electronically controlled regenerative braking system has been adopted, with control logic optimized to enhance regeneration. A larger and more powerful 1.8-litre Atkinson-cycle, four-cylinder engine powers the new Prius. Contrary to conventional wisdom, the larger engine actually helps improve highway mileage. By making more torque, the new engine can run at lower average RPM on the highway. When operating at lower RPM, the new engine uses less fuel. Mileage is especially improved in cold-start conditions and at higher speeds. Use of an electric water pump and a new exhaust gas recirculation (EGR) system also contribute to the engine’s efficiency. The 1.8-litre Prius engine is the first Toyota power plant that requires no belts under the hood for better fuel economy and less potential maintenance. A multi-information display panel that monitors fuel and energy consumption is standard. It provides feedback on the Prius’ efficiency using three different displays to help the driver acquire economical driving habits. In designing the new Prius, aerodynamic performance was an important factor. The goal was to create a beautiful silhouette, while not compromising function. Designers preserved the dynamic triangle form of the current model--instantly recognizable as a Prius--but made alterations to the overall profile, pillar position and angle. The front pillar, extended forward, helps refine the performance-focusing, shaped form. The overall height of the Prius is the same, but the roof profile is altered by moving the top of the roof 99 mm (3.9 inches) to the rear. This emphasizes the wedge shape, and also allows for enhanced rear headroom and improved aerodynamics. The design of the new Prius’ front and rear corners are sharp, sporty and aerodynamic. Strong side character lines, rising from front to rear, define the glazed geometric shape. Viewed from the rear, wider rear treads provide a solid, firmly rooted stance. Dimensionally, the new Prius has the same wheelbase as the current generation. Overall length is slightly increased by 15.2 mm (0.6 inches), in part by moving the front cowl forward. The new Prius received more wind tunnel hours of testing than any other Toyota in history, resulting in the cleanest aerodynamic profile of any mass-produced vehicle in the Toyota line up. That means less drag for better fuel efficiency and an even quieter ride. By focusing on the shape of the body, underfloor, wheelhouse liner and shape of the wheels, the designers of the new Prius were able to reduce the coefficient of drag (Cd) value to 0.25, compared to 0.26 for the previous model. The airflow under the car was studied extensively. Engineers made changes to the shape of the fender liner, front surface of the underfloor, and added a fin at the rear floor cover to increase linear stability. An available sliding glass moon roof is packaged with solar panels, located over the rear seating area, that power a new ventilation system. This solar ventilation system uses an electrically powered air circulation fan that does not require engine assist. The system prevents the interior air temperature from rising while the vehicle is parked, making the cool-down time shorter when the driver returns to the vehicle, thus reducing the use of air conditioning. The remote air-conditioning system is the first system in the world to function on battery-power alone and that can be remotely operated, so the driver can adjust the interior temperature for comfort before getting in the car. Reducing the vehicle’s power consumption, available LED (light emitting diode) lamps are used for low beams and also in the tail and stop lamps. Air conditioning, a major energy drain, has been re-engineered to increase efficiency and cool-down performance. In addition, an exhaust heat recirculation system reduces heat waste by warming engine coolant during cold start-up, for improved performance. It also heats up the passenger cabin more efficiently. The next-generation Prius is built on a new platform, which enables improved handling stability, quieter operation, and collision safety. The suspension consists of front struts and a rear intermediate beam design, as before, but handling stability is advanced by improving the stabilizer layout, higher caster angle and tuning the bushing characteristics. Disc brakes are now used on all four corners, replacing the front disc/rear drum brakes in the current model. Weight was saved through use of aluminum in the hood, rear hatch, front suspension axle and brake caliper and super high-tensile steel in the rocker inner, centre pillar, and roof reinforcement. Better-performing sound insulation, working with improved vibration damping, has been installed in various locations to reduce road noise. Proving that small changes add up to big gains, the cargo area of the new Prius was expanded by 10 mm (0.4 inches) in length and 56 mm (2.2 inches) in width by using a new and an improved layout of the battery cooling unit. Rear seat legroom is enhanced by a new space-saving contoured frontseat design. Viewed from the cockpit, the centre cluster smoothly flows from the instrument panel to the console. Handy storage space has been added under the shift lever by taking advantage of the shift-by-wire system. Simple, fin-type air vents are consistent with the cabin’s efficient appearance. Judicious use of silver accents adds a finished, technical feel. Touch sensors on the steering wheel switches are designed to reduce driver eye movement for better concentration on the road. When the driver touches the audio or info switch located on the steering wheel, a duplicate image is displayed on the instrument panel, directly in front of the driver. This system, called Touch Tracer, is the first system in the world to allow steering wheel controls to read out on the instrument panel. The ECO indicator on the Multi-Informational Display (MID) provides driver feedback for lower fuel consumption. In pursuit of developing various advanced technologies aimed at realizing sustainable mobility, Toyota will use plant-derived, carbon-neutral plastics in the 2010 Prius. The newly-developed plastics, known as “ecological plastic,” will be used in the seat cushion foam, cowl side trim, inner and outer scuff plates, and deck trim cover. Ecological plastic emits less CO2 during a product lifecycle (from manufacturing to disposal) than plastic made solely from petroleum; it also helps reduce petroleum use. The new Prius was designed to comply with top collision safety performance requirements in each global region of sale, and to accommodate increasingly strict safety requirements in the future. Standard safety features include seven airbags (driver and front passenger Supplemental Restraint System (SRS) airbags, front and rear side curtain airbags, driver and passenger seat-mounted side airbags, and knee airbags) to cocoon occupants in the event of an accident. Toyota’s Active Headrest System is used in both front seats to reduce the possibility of whiplash in a collision. Anti-lock Brake System (ABS), Electronic Brake Distribution (EBD), Brake Assist (BA), electronic traction control (TRAC) and Vehicle Stability Control (VSC) are all standard features and perfect for confident handling in any climate. An available Dynamic Radar Cruise Control system uses advanced millimetre wave radar, and feeds information to the available Pre-Collision System, which retracts seatbelts and applies the brakes in certain conditions when the vehicle determines that a crash is unavoidable. Next-generation Intelligent Parking Assist features simplified settings to help guide the car into parking spaces. A backup monitor, which provides a view of rear obstacles when reverse is engaged, is available with an optional voice-activated navigation system. The development of the Prius has required applications for over 1,000 patents filed across the world. 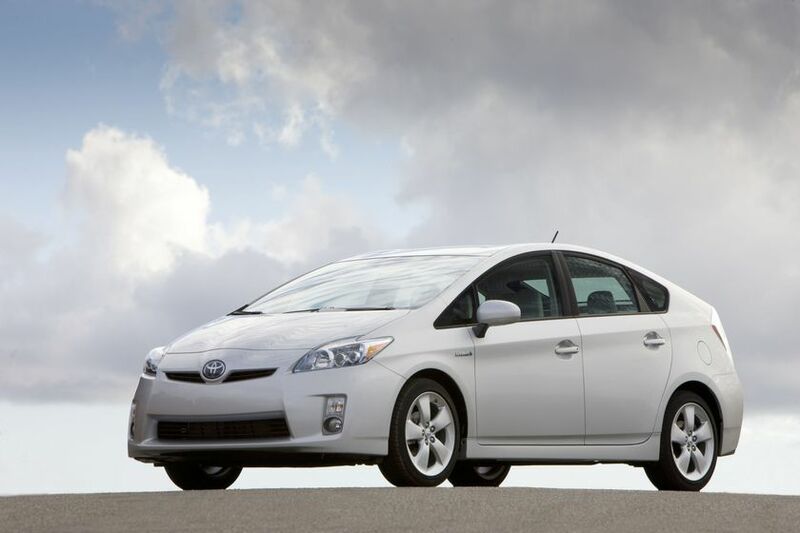 Pricing for the 2010 Prius will be announced shortly before it goes on sale in late spring. * Preliminary figure based on Toyota’s internal testing. Actual fuel consumption may vary.